Welcome to February Twin Cities! The month of LOVE! 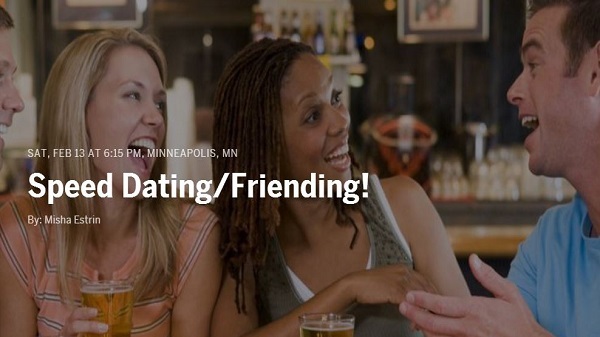 We care about our readers who are single and would like to offer them a cool chance to “get out there” and meet some people! So first things first, this event is 21+ Meaning you must be 21 or older to attend!! For this event you will get 3-5 minutes of one on one time with an amaZing person! When the bell rings, you will rotate to the next table and meet someone new! At the end of the night you will meet over 25 potential new friends, professional connections, or romantic encounters. Win, win, WIN! Reserve your spot now. RSVP and get a $2.47 discounted ticket! Please note this Event WILL sell out! You’ll get a prompt for a deep meaningful conversation question each time you switch (you can take this or choose not to) The goal is to empower everyone to establish a real connection with the people they’re meeting. So make 2016 your best year ever and get out and meet some new friends, a new connection and who knows…your future spouse. Never say never…it COULD happen! I’m hosting the event! LMK if you have any questions bc I’d love to answer them!